Welcome to <a href="Pathophysiology of Complex Patient Problems">PT 635 Pathophysiology of Complex Patient Problems</a> This is a wiki created by and for the students in the School of Physical Therapy at Bellarmine University in Louisville KY. Please do not edit unless you are involved in this project, but please come back in the near future to check out new information!! Original Editors - Students from Bellarmine University's Pathophysiology of Complex Patient Problems project. 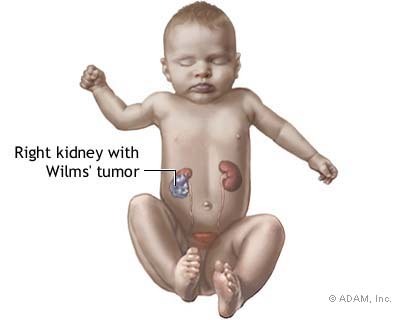 Wilms’ Tumor, also known as nephroblastoma, is a solid tumor of the kidney that develops from immature kidney cells. It is the most common cancer of the kidneys in children, and the fourth most common type of cancer in children. 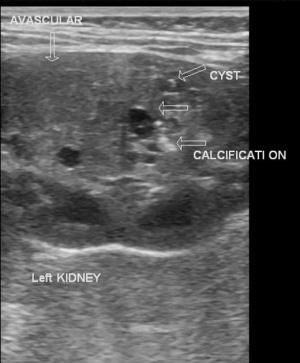 Wilms’ tumors are most often unilateral, affecting only one kidney. 5-10% of children with Wilms’ tumors have more than one tumor in the same kidney, and approximately 5% of children with the cancer have bilateral Wilms’ tumors, affecting both kidneys. Wilms’ tumor is most common in children ages 3 to 4 and becomes much less common after the age of 5. Wilms’ tumor affects boys are girls equally, and can also be found in adults, though it is very rare. On average, there are 460 new cases of Wilms’ tumor diagnosed in the United States every year. Approximately 1 in 8,000-10,000 children are affected. About 5% of all cancers in children are Wilms’ tumors. Wilms’ tumor is often hard to find early because the tumor can grow large without any signs or symptoms. These children may look and act normally. 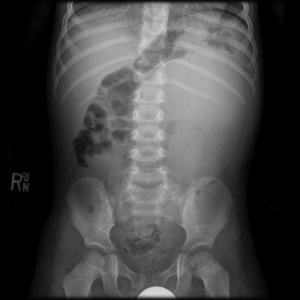 The most common first clinical sign is swelling or a hard mass in the abdomen. It is often firm and large enough to be palpated on both sides of the abdomen, and is usually not painful. Wilms’ tumors may also cause high blood pressure. The blood pressure can get high enough to cause bleeding in the eye or a change in consciousness in rare cases. Physical Examination: Usually first symptoms in adults include pain and haematuria, while children experience palpation detectable, painless, rapidly increasing size, abdominal mass. Blood and Urine Tests: A urinalysis may also be performed to look for blood and other substances like catecholamines to rule out adrenal issues. Wilms tumor can not be diagnosed by a blood or urine test, but it can provide an overall assessment of health. This may include ultrasound, Magentic resonance imaging (MRI), and Computerized tomogrpahy (CT) scan. Definite diagnosis can only be made by surgical resection or biopsy. Wilms’ tumor is typically seen in otherwise healthy children, and the exact cause in most children is unknown. However, approximately 10% of patients with the tumor have a congenital anomaly, including certain birth defect syndromes and genetic changes. Wilms’ tumor, whether hereditary or sporadic, shows evidence of changes in one or more of at least ten different genes. Kidneys are developed early in fetal growth. Gene mutations in early kidney cells may lead to undeveloped mature kidney cells. These early kidney cells may remain after birth. If the cells do not mature, they may grow out of proportion, forming a Wilms’ tumor. Genes WT1 and WT2 on chromosome 11 are tumor suppressor genes, and mutations of these cause a small number of Wilms’ tumors. WAGR Syndrome: WAGR stands for Wilms tumor, Aniridia (lack of the iris of the eyes), Genitourinary tract abnormalities, and mental retardation. Children who have WAGR syndrome have approximately 30-50% chance of developing a Wilms’ tumor, and often have them bilaterally. In this syndrome, cells are missing part of chromosome 11, which involves the WT1 gene. Beckwith-Wiedemann sydrome: These children are at a 5% risk of having a Wilms’ tumor. This syndrome is caused by a malformation of chromosome 11. Denys-Drash Syndrome: This syndrome is also caused by mutations to the WT1 gene. The risk for Wilms’ tumor in these patients is greater than 90%. In this disease, the kidneys become diseased and no longer function at a very young age, leading to a Wilms’ tumor. Wilms’ tumors often grow to a large size before any symptom manifestation. 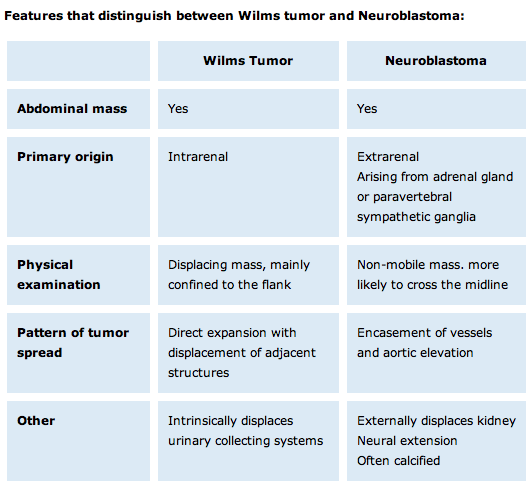 However, most Wilms’ tumors do not metastasize, despite their large size. Hematuria occurs in approximately 30% of cases, and about 25% of children with the tumor will have hypertension. As with all cancer treatment, there may be systemic side effects from chemotherapy and radiation. These may affect the heart, lungs, fertility, skin reactions, and may increase the risk for a second cancer. Management of Wilms’ tumor involves surgery, chemotherapy, and radiation therapy. Most children will receive more than one type of treatment. Treatment is based on both the stage and histology of the Wilms’ tumor. Simple Nephrectomy: The entire kidney is removed, and the remaining kidney can increase its capacity and filter all of the blood. Partial Nephrectomy: This surgery includes resection of the tumor and a section of the kidney tissue surrounding it. Partial nephrectomy is common when the other kidney is damaged or removed. Radical Nephrectomy: The kidney and surrounding tissues of adrenal gland and ureter are removed. Chemotherapy: Most children diagnosed with a Wilms’ tumor will receive chemotherapy as one of their treatments. Powerful anti-cancer drugs are typically injected via vein, and the blood carries the drug throughout the entire system.8 Chemotherapy is typically used after the tumor has been surgically removed. Radiation Therapy: This treatment utilizes x-rays and other high-energy rays to destroy cancer cells and shrink the tumor size. The type of treatment received is determined by the stage of the cancer, the type of cell, and the general health of the patient. Stage I or II: The cancer is limited to the kidney or surrounding structures. Typically the kidney will be removed, as well as tissues and lymph nodes surrounding it. This will be followed with chemotherapy, and some stage II may need radiation. 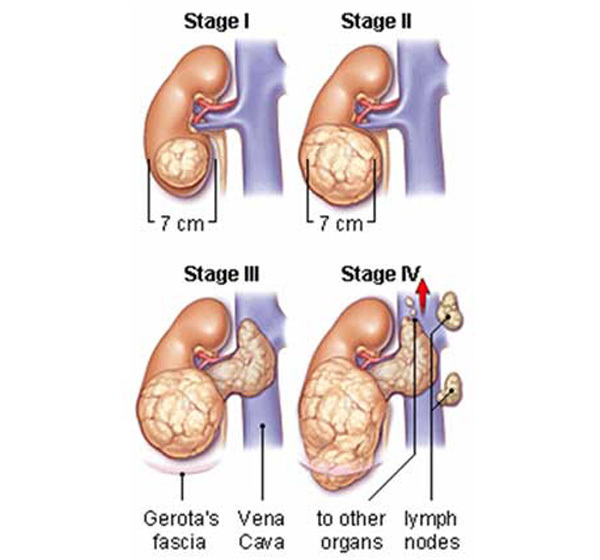 Stage III or IV: The cancer has spread outside of the kidney and cannot be removed with surgery. Radiation, along with surgery and chemotherapy will most likely take place. 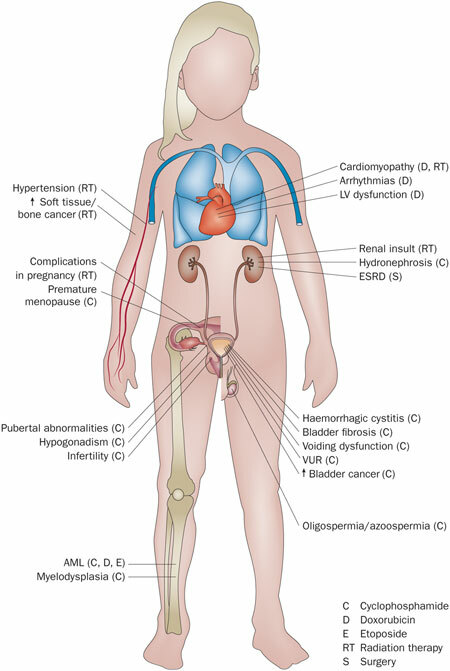 Stage V: Wilms’ tumors in bilateral kidneys. Chemotherapy is typically given first to shrink the tumor initially, followed by surgery and radiation. There are several long-term side effects of chemotherapy. Childhood cancers tend to respond better to chemotherapy than adult cancers. Children’s bodies also tend to tolerate it better than adults do. Side effects of chemotherapy can include fatigue or extreme tiredness from having too few red blood cells. Physical therapy interventions may include strengthening postural muscles and also increasing endurance to promote a higher quality of life. Patients should avoid heavy lifting due to the decreased bone density and risk of osteoporosis. Complementary medicine is treatment used in combination with regular medical care. Alternative treatments are used instead of the traditional medical treatment. ↑ 1.0 1.1 1.2 1.3 1.4 St. Jude’s Children Research Hospital: Wilms Tumor. Available at http://www.stjude.org/stjude/v/index.jsp?vgnextoid=5ceb061585f70110VgnVCM1000001e0215acRCRD. Accessed 15 March 2014. ↑ 2.00 2.01 2.02 2.03 2.04 2.05 2.06 2.07 2.08 2.09 2.10 2.11 2.12 2.13 2.14 2.15 Mayo Clinic: Wilms Tumor. Available at http://www.mayoclinic.org/diseases-conditions/wilms-tumor/basics/definition/con-20043492. Accessed 16 March 2014. ↑ 3.00 3.01 3.02 3.03 3.04 3.05 3.06 3.07 3.08 3.09 3.10 3.11 3.12 3.13 3.14 3.15 3.16 3.17 3.18 3.19 3.20 3.21 3.22 3.23 American Cancer Society: Wilms Tumor. Available at http://www.cancer.org/cancer/wilmstumor/index. Accessed 16 March 2014. ↑ 4.0 4.1 4.2 4.3 4.4 4.5 4.6 Radiopaedia: Wilms Tumor. Available at http://radiopaedia.org/articles/wilms-tumour. Accessed 24 March 2014. ↑ 7.0 7.1 Medline Plus Encyclopedia: Wilms Tumor. National Institutes of Health. Available at http://www.nlm.nih.gov/medlineplus/ency/article/001575.htm. Accessed 15 March 2014. ↑ 8.0 8.1 8.2 Dome JS, Huff V. Wilms Tumor Overview. 2003 Dec 19 [Updated 2013 Sep 19]. Available at http://www.ncbi.nlm.nih.gov/books/NBK1294/. Accessed 15 March 2014. ↑ 9.0 9.1 Goodman CC, Fuller KS: Pathology: implications for the physical therapist, ed 3, Philadelphia, 2009, WB Saunders. ↑ 10.0 10.1 Children’s Cancer Research Fund: Wilms Tumor/Nephroblastoma. Available at http://www.childrenscancer.org/main/wilms_tumor_nephroblastoma/. Accessed 15 March 2014.